Why Choose the Microbiology and Immunology Program? Wright State’s Microbiology and Immunology program has established a tradition of producing graduates who excel as doctors, dentists, and veterinarians in Ohio, across the U.S., and in countries around the world. You will join those whose postgraduate work at Wright State led them into a career field where the demand for qualified workers by corporations, government offices, higher education, and research is consistently high. If you love the Dayton area (and we are sure you will), there are many opportunities in area healthcare, research laboratories, tech and defense companies, and Wright-Patterson Air Force Base. 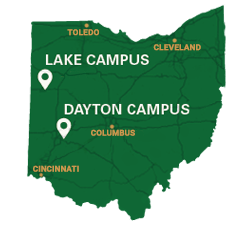 Wright State’s excellent facilities include access to constant temperature rooms, coldrooms, darkrooms, animal care facilities, and cell and tissue culture facilities. The equipment includes the latest available technology in fluorescent microscopes, flow cytometry, and mass spectrometers. You will learn about the human body and how it interfaces with its immune system to battle foreign organisms. Pursue a specialty in areas like immunology, virology, immunotoxicology, DNA and conventional vaccine development, and molecular genetics. Whatever specialty you choose, you can be confident your M.S. from Wright State will open the doors for incredible career opportunities across the globe. View Master of Science in Microbiology and Immunology program information and degree requirements in the University Catalog. Additional graduate level courses may be selected from the Departments of Biological Sciences, Biochemistry and Molecular Biology, Neuroscience, Cell Biology and Physiology, Pharmacology/Toxicology, Mathematics and Computer Science. Students are strongly encouraged to enter into the program only in the Fall Semester, although admission is permitted at other times in exceptional circumstances. The applicant should have taken a distribution of undergraduate courses in biological sciences, chemistry, physics and mathematics that would support his or her anticipated graduate study. Students are required to submit three letters of recommendation from individuals who can evaluate the applicant's ability handle graduate-level course work and research. Recommendations should reflect professors' knowledge of the applicant's undergraduate performance in the sciences and/or from the student's work. The recommendations should describe the applicant's competence in understanding and performing work in a science-related area and reflect the ability of the candidate to accomplish the graduate level work in microbiology/and immunology. A personal statement summarizing the applicants interests in the fields of Microbiology and Immunology is required. The Master of Science in Microbiology and Immunology degree program is one of Wright State’s most popular among international students. The versatility this degree offers makes navigating the admissions process well worth the effort. To start, review the International Admissions Graduate Admission Requirements page. International students entering the M.S. in Microbiology and Immunology program whose undergraduate GPA is less than 3.0 must submit (IELT, TEFL, GRE) scores. Applicants with GPAs of 3.0 and above are still encouraged to provide (IELT, TEFL, GRE) scores to assist in admission decisions. Non-English-Speaking international students must pass an oral proficiency test before starting the research or teaching portion of their program. Admission and registration forms and procedures are available through the Graduate School. Two graduate teaching assistantships are available on a competitive basis. These carry a waiver of most tuition and instructional fees. Appointments are made for one year and may be renewed for a second year.